A rendering of potential development in Two Bridges provided by the developers. Farthest left is the Extell tower, which is already nearing completion. 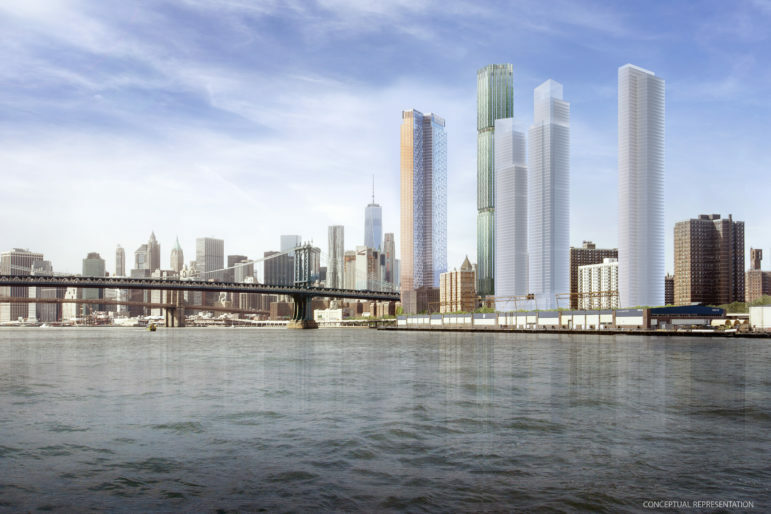 The other four towers have yet to be approved and are the subject of the fight. It’s been over a year since Councilmember Margaret Chin and Borough President Gale Brewer wrote to the De Blasio administration expressing their concern about the four skyscrapers planned by three private developers in the Two Bridges area of the Lower East Side waterfront. After months of special community engagement meetings, community advocates and residents are not placated; Their concerns have only grown, and they’re making a variety of efforts to prevent the projects’ potentially approaching approval. As earlier reported by City Limits, the four towers would each rise to roughly between 700 and 1,000 feet and sit directly next to a fifth tower already nearing completion. While the developers have said their project will bring a portion of income-targeted housing with the 421-a tax credit (now known as “Affordable New York”), as well as desirable community amenities, most residents are terrified that the development will alter the entire character of the area, cause the displacement of local residents and stores, strain local infrastructure and cast shadows on nearby buildings and parks. The developers’ plans do not require a rezoning, but do hinge on the city amending a set of special regulations that govern those parcels of land. In June 2016, Chin and Brewer asked the Department of City Planning (DCP) to require the developers’ request for those regulation changes to go through the Uniform Land Use Review Procedure, the seven-month process through which the community board and local electeds each have an opportunity to weigh in on a land-use change—with the City Council having the ultimate decision. But DCP said requiring ULURP in the case of the four Two Bridges buildings was legally impossible: according to DCP, the developers were only asking for “minor modifications” to existing regulations that don’t require ULURP. Instead DCP asked the developers to participate in an extended community engagement process: they voluntarily agreed to four extra meetings to discuss the developments with the community. That community engagement process, however, became unsatisfying to many residents and community advocates, who could not be sure how their demands would be taken into account and who resisted the idea of accepting the towers in exchange for what seemed to them meagre amounts of affordable housing and community amenities. (The developers, for their part, argue that they remained committed to the engagement and created reports documenting all the feedback they received.) Meanwhile, a task force of local stakeholders came together—an idea of a local tenant leader, but formally organized by Chin, but that group too faced difficulties, like disagreements about strategy. Some community members blamed Chin for failing to prod the de Blasio administration to accept the Chinatown Working Group plan, a comprehensive rezoning proposal for Chinatown and the Lower East Side which would have set height limits and higher affordability requirements in the Two Bridges area, preempting projects of the scale now under consideration. Several actions are now underway. Chin is seeking to deploy a variety of means to require more public input on the towers. 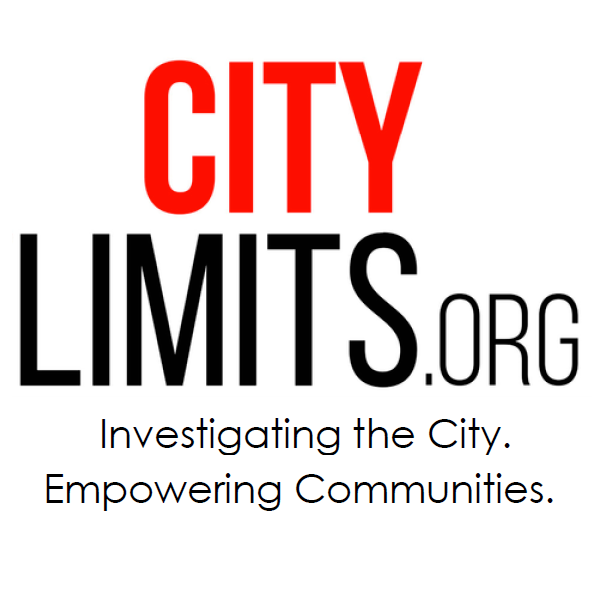 One set of community groups, with Chin’s backing, has threatened the Department of City Planning with a lawsuit if the department doesn’t change the process through which the skyscrapers are approved. Another coalition insists they have a means to scrap the towers altogether, and accuse Chin and other groups of only fighting for community benefits and of being willing to accept the new skyscrapers—an accusation Chin and those other groups take issue with. Every stakeholder involved, however, is united in their frustration with what they see as the city’s convoluted presentation of the legal issues involved. Here’s our best effort to break down some of the technical, but hugely significant, legal disagreements in layman’s language. Everything would be simpler if the blocks between Cherry Street and South Street, just north of the Manhattan Bridge, were simply governed by a zoning district, like most areas of the city. The zoning in that area is C6-4, permitting large commercial and residential buildings with no height limit, making it a nice spot for developers. The difference in the two lies in the types of regulations they modify. For instance, authorizations modify what kind of facilities and commercial establishments can be located in the area, while special permits modify commercial and community facility parking regulations. They also each modify different aspects of building bulk and layout. Authorizations tend to allow smaller changes, and only special permits need to be approved through ULURP. C6-6 — The area’s zoning district. It allows big residential and commercial buildings with no height limit. Large Scale Residential Development (LSRD) — The City Planning Commission can issue “authorizations” or “special permits” that change the regulations governing the site in a way that facilitates better site-planning. Special Permits — Another type of permission from the City Planning Commission to change the regulations to facilitate better site-planning, usually allowing bigger changes than authorizations. They require the City Planning Commission to evaluate whether the new site plan will meet certain “findings,” and they also must be approved through the Uniform Land Use Review Procedure. Findings — Criteria, especially that the new site plan will not harm the surrounding neighborhood, that must be met before the City Planning Commission approves a special permit or authorization. The Uniform Land Use Review Procedure (ULURP) – The seven-month process through which the community board, borough president, City Planning Commission, and City Council decide on certain land use changes. It’s required before the city can make changes to the zoning district or issue special permits. For both authorizations and special permits, however, the City Planning Commission is required to assess whether the modifications will satisfy a number of “findings,” such as that the new site plan benefits both residents and “the city as a whole,” that the changes don’t increase the density of the area “to the detriment of the occupants of buildings in the block or nearby blocks,” and that the changes won’t restrict access to light or air in the surrounding areas, among others. Pedal back to the summer of 2016. The developers had bought land in Two Bridges, which was already zoned for high densities, but they needed to make some changes to the LSRD—changes like increasing allowable floor area and lot coverage, reconfiguring buildings to allow for ground-floor retail and relocating parking spaces from one part of the property to underground. That’s when Chin and Brewer wrote to the Department of City Planning. They argued that the city needed to issue the developers new special permits, which required both that the City Planning Commission evaluate whether the projects would meet the necessary “findings,” and also that the entire process go through ULURP, giving Chin, Brewer, and the local community board a chance to weigh in. In August 2016, Carl Weisbrod, then director of the Department, basically responded as follows: the projects themselves might be big, but the changes the developers are asking for don’t require special permits. And they don’t even require authorizations. All they require is “minor modifications” to the existing special permit, which need approval by the City Planning Commission, but do not require a determination of whether they meet certain “findings” and certainly not ULURP. The projects would, however, collectively go through a single environmental review analysis, and the developers would engage in an extended community engagement process, City Planning said. Now, a year of community engagement meetings later, Urban Justice Center lawyers, working on behalf of groups like GOLES, CAAAV: Organizing Asian Communities, Tenants United Fighting for the Lower East Side (TUFF-LES), and others, found what they believed is a way to legally challenge Weisbrod’s ruling. In a letter delivered to the City Planning Commission on August 11, UJC lawyer Paula Segal and two other UJC attorneys argue that it’s illegal to make the “minor modifications” referenced by Weisbrod in an LSRD (except in specific circumstances); they say that all changes in an LSRD require either an authorization or a special permit. In particular, they take issue with Weisbrod’s August 2016 letter, which defines “minor modification” by referencing a rule they say is irrelevant to the matter at hand. “Should approvals for the proposed towers be granted at the conclusion of the deficient process outlined in the August 2016 letter and now underway, our clients will exercise their right to seek judicial review,” threatens the attorneys. While DCP has not offered UJC a formal response to its letter, on August 31 DCP offered a detailed reply, over 1,100 words long, to a City Limits inquiry. It argued that minor modifications are indeed allowed in LSRD and that a “minor modification” is a modification that “requires no new zoning actions, requires no new waivers, requires no increasing of existing waivers, [and] does not negatively affect any of the findings of the Commission with respect to previously granted authorizations or special permits for waivers.” The city has issued one “minor modification” in Two Bridges before—in 2013, for the construction of a facility for the healthcare organization Healthcare Chaplaincy, though that structure was not built. LESON says they’re different from the others. “The end game for Council member Chin, GOLES, TUFF-LES, CAAAV, LEOTA and UJC is to allow the Megatowers to be built and negotiate for a few more affordable units…LESON and community supporters do not want the Megatowers to be built,” wrote the group in a recent position paper, pointing to a recent statement from Chin to the press in which she said she hoped to secure “more benefits” for the community through the ULURP process. LESON’s lawyer has for months has been making an argument with the same premise as the one pursued by the Urban Justice Center—that the developers require authorizations or special permits to make changes in an LSRD. Yet unlike Chin and some other groups that are calling for ULURP (required in the case of special permits), LESON says everyone should focus their advocacy on insisting that the City Planning Commission must hold a hearing on, and evaluate, whether the developments will live up to the necessary “findings,” and that the city and state conducting a rigorous environmental review process. They argue that if a truly independent environmental analysis were conducted, it will be impossible for the City Planning Commission to conclude that the projects reach the “findings” necessary for approval, and that the commission will be able to squash the projects altogether. It might seem risky to hedge one’s bets on the city agreeing to do a rigorous environmental review. Time and again, community groups have found that when they loudly demand more comprehensive environmental reviews, the city has proceeded to use the same method of analysis that critics say underestimates the negative impacts of development. LESON argues that this situation is different from most zoning changes, in which the developer is not legally required to prove that the project’s negative environmental impacts will be mitigated. In this case, the “findings” clause of Chapter 8 of the zoning text legally mandates that the changes have no negative impacts on air, light, traffic congestion, etcetera. Chin and other groups that are the target of LESON’s criticism say they support LESON’s goal to get the commission to evaluate “findings”—they just also think ULURP is a necessity. A spokesperson for Chin says it’s a possibility that the developers would find a way to convince the City Planning Commission that the four giant towers of mostly luxury housing will indeed reach the mandated “findings,” so they think ULURP might be the only way to provide real protections for the community. As to the question of whether Chin and others are fighting to stop the towers or just for community benefits, Chin’s spokesperson says she’s focused on ULURP because she wants to create an opportunity for real community input into the projects. The ultimate outcome could mean more community benefits or a rejection of the project—all that would depend on residents’ input during ULURP. And other groups like GOLES and CAAAV told City Limits that their support for ULURP and UJC’s letter in no way means they’ve given up on passing the Chinatown Working Group Plan and rezoning the waterfront before the developments can be built—in fact, it’s still one of their priorities. In addition to throwing her weight behind UJC’s lawsuit, Chin also introduced a bill last week that would allow elected officials to fast-track certain changes to the zoning text (excluding rezonings). The bill would allow elected officials to skip the “pre-application” phase of paperwork and meetings that proceed the start of environmental review and ULURP. Chin hopes that with such legislation passed, she’ll be able to immediately make a change to the zoning text to make it absolute that any development in an LSRD requires a special permit and must go through ULURP. This is in addition to legislation she introduced in April which would require the Department of Housing, Preservation and Development (HPD) to notify the public if an Urban Renewal Area were about to expire—a measure aimed primarily at ensuring other communities are more prepared next time in the event that URA regulations expire, liberalizing what can be built. While Chin’s challengers in the September 12 primary have blasted Chin’s flurry of action as an election-year stunt, a spokesperson for Chin says that her team has been pushing for ULURP all year long and has really wracked its brain to come up with solutions. While Chin wishes to work with the mayor’s office and DCP, they have now come to the conclusion that more forceful options must be taken, the spokesperson said. Is it too late to rezone the neighborhood to preempt the Two Bridges developments? It’s theoretically still possible, but challenging. According to the Department of City Planning, developers are allowed to build under the prior zoning if they construct their building foundations before the zoning is changed (and they can only begin construction after getting the regulatory modifications they need), and if they actually build the building and acquire Temporary Certificates of Occupancy within two years of the zoning change. There are also specific rules governing how these timelines shift if the projects are held up by a court challenge. A spokesperson for Chin views rezoning the waterfront to prevent the towers as still possible, though difficult, and she mentioned Chin’s support for an effort lead by Community Board 3 to move forward with such a rezoning. She hasn’t said much at press conferences about a rezoning of the waterfront, instead prioritizing calling for ULURP in the case of the Two Bridges developments—which, in any case, could buy time for a rezoning. Community Board 3 actually isn’t currently working on any rezoning proposal waterfront at this time, but in the past has supported it and says it’s open to collaborations with groups that do want to push forward with such an idea. This is outrageous this has far more environmental consciences and affects all city residents, This is a epidemic through out ny .And all city officials should be ran out of office for not protecting our neighborhood’s. Once again money is the root of this we need affordable housing not luxury eyesores!!. Why didn’t Councilwomen Chin IMMEDIATELY REJECT the 4 Towers Development FROM THE VERY BEGINNING, not simply require more “community input”, which, as we know all to well, is a total surrender to the developers? Why does councilwoman Chin need to make the mayor happy? It seems that many of her constituents are beginning to see through the smoke screen. Sometimes it’s the past that gives a better perspective on the present and the future. That area of Manhattan is a horizontal, “living” neighborhood now. A future mega vertical neighborhood would be as sterile as it sounds. People should review some of the controversy that erupted during the time Robert Moses was changing the “complexion” of neighborhoods across NYC. Or to be more precise- others people’s neighborhoods. Moses rammed through the Cross Bronx Expressway and cut through and destroyed viable middle class communities and for 50 years the Bronx was never the same. Highways are different from “high rises” but the impact to the character of communities is the same. It destroys neighborhoods. Moses was stopped when his obsession with highway development would have cut through the Manhattan foot of the Brooklyn Bridge with an expressway that would make a left turn at City Hall and eventually drive a bridge from the Battery to Staten Island. The drive for real estate profit has to be tempered with the real concerns of all the people in the area and the city. And it should be a concern of all New Yorkers what kind of city do we want- a cold sterile megalopolis of isolated people living far above the city or a city of viable neighborhoods of citizens caring and interacting with each other on a human, caring level? Moses was stopped when everyone in the city woke up and realized what was going on and what was at stake. Maybe it’s time for people to come out of our trances and look around at how the complexion of the city, as a whole, is being transformed. Enough glass towers,already . There can’t be that many upper income tenants,who really will live in them,to occupy all of these eyesores. This city is being sold to any and all developers,with no accomodation for an infrastructure that can support all of this…not to mention little or no truly affordable housing for the Rest of us. Enough is enough. These towers overburden the neighborhoods in which they are built. They bring with them retail blight which hurts the neighborhoods. Plus, they choke up the waterfront. Enough is enough! Come Tuesday, voters in Council District 9 must decide whether the smart response to sweeping neighborhood change and hostile national politics is to stay the course in local leadership—or to change that, too. District 8 candidates Robert Rodriguez and Tamika Mapp explained their approach to protecting the lowest income residents from displacement, policing the homeless, and more. News from the City Council this week includes the passage of the Downtown Far Rockaway rezoning, the approval of a temporary relocation site for the District 11 Sanitation Garage and forward momentum for the African Burial Ground Project.